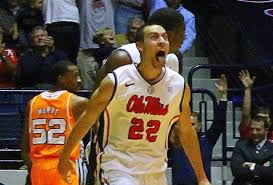 There has not been a more talked about figure in Mississippi and nationally the last few weeks than Ole Miss Shooting guard Marshall Henderson. He has been a lightning rod for controversy. All year long I have kept quiet on the Henderson talk but now I have to address it. It may surprise you that I will not direct this at Henderson but the Ole Miss fans rationalizing his actions. That is who I’m fed up with. A few things I need to get out of the way before I get started. I really enjoyed watching Henderson on the court this year. Outside of MSU, I watched mostly Rebel basketball because of him. I commend Andy Kennedy for taking a gamble and bringing him in. He was the final piece they needed to get to the NCAA tournament. Also, I don’t believe there is another coach in America that could have kept Marshall focused enough to keep him on the floor all year. In a strange way I think Kennedy can relate to Marshall and has gotten more out of him than any other coach. In this post I will not slam Marshall or his behavior. If making bad decisions at 22 was an art, I’d be freaking Vincent Van Gogh. I could not pass judgment on him without being the biggest hypocrite in the world. I am completely comfortable calling out all the Ole Miss fans that decide to make excuse after excuse for him of late. It’s ridiculous. I could go on forever with excuses but here are a few. To be fair, not all Ole Miss fans are out there staunchly defending his actions. Many are being very quiet as I would be. The point is simple; no way reasonable adults should condone or makes excuses for his behavior. I’ll go back to myself as an example. A lot of my immature mistakes at 22 were not defendable by my parents. If they would have made a bunch or excuses or rationalizations they would have looked like morons. That doesn’t mean they had to stop loving me. Do you get it Rebel fans? You don’t have to stop loving Marshall but when you make excuses for him you look like morons. Let’s draw another parallel. Nothing I hate more than social media around election time. It drives me nuts. One thing is that I get the political views, wanted or not, of all the folks I follow on twitter. All the Ole Miss fans I follow are about as conservative as it gets and that is to be expected in the South. Nothing wrong with that at all. I saw too many tweets from yall speaking on how sick you were of entitlements and how every person should accept some personal responsibility. Those were your morals. Now when it comes to athletics, those same morals don’t count because he plays for your school. Where did the personal responsibility go? I also need to touch on that I completely understand taking up for your own but there is a limit. An example that I’m ok with was Jeremiah Masoli. When the Rebels gave him another chance many MSU fans took every opportunity to take shots at him. Rebel fans defended him and his character. I’m in agreement with this case because he came to Ole Miss and his plays coupled with his actions were that of a role model. He kept his nose clean and represented Ole Miss well. This isn’t the same thing. From this point forward there is little doubt that everything Marshall does will be under a microscope. I hope he learns from his actions and matures. I will not stop watching him play and Ole Miss fans should not stop cheering for him when he drains a 3. What Rebel fans should stop doing is making excuse after excuse for his actions that don’t represent the university and himself in the best light.